Eindhoven, The Netherlands - Philips Lighting (Euronext: LIGHT), the world leader in lighting, is now offering Light Fidelity (LiFi), a technology in which high quality LED lighting provides a broadband Internet connection through light waves. As the lighting company for the Internet of Things, Philips Lighting is the first global lighting company to offer LiFi-enabled luminaires from its existing office lighting portfolio. "LiFi has enormous potential for today's digital age and as the world's leading lighting company we are proud to pioneer new and innovative services for our customers," said Olivia Qiu, Chief Innovation Officer, Philips Lighting. "While radio frequencies are becoming congested, the visible light spectrum is an untapped resource with a large bandwidth suitable for the stable simultaneous connection of a vast array of Internet of Things devices. Being a lighting company, we ensure that our customers benefit from the finest quality energy efficient light along with state-of-the-art connectivity," she added. LiFi is a two-way, high-speed wireless technology similar to WiFi but uses light waves instead of radio waves to transmit data. Philips Lighting's office luminaires enabled with LiFi technology provide broadband connection with a speed of 30 Mb per second (Mb/s) without compromising lighting quality. With 30Mb/s a user can stream simultaneously several HD quality videos while having video calls. Icade, the French real estate investment company, is piloting the ground-breaking technology in its smart office in La Defense, Paris. "LiFi has the potential to be a real game changer in offices. As the leader in our market we wanted to explore the possibilities of this technology for existing and future clients. We plan to showcase the technology in our smart office in La Defense, so aside from stable connectivity, light quality is crucial to us," said Emmanuelle Baboulin, Head of the Commercial Property Investment Division at Icade. Philips Lighting will be present at Light+Building 2018, at the Philips Lighting booth in Hall 0: Forum. Media and bloggers are invited to join the Philips Lighting press conference, on Monday, March 19, at 1.00pm at the Philips Lighting booth. You can also watch the press conference webcast live Click here. LiFi offers benefits over WiFi as it can be used in places where radio frequencies may interfere with equipment, such as in hospitals, or where WiFi signals cannot reach or are weak, such as underground. Other user cases include environments demanding high security; for example, the back office of a financial institution or government service. LiFi adds an extra layer of security as light cannot pass through solid walls and a line-of-sight to the light is needed to access the network. Each luminaire is equipped with a built-in modem that modulates the light at speeds imperceptible to the human eye. The light is detected by a LiFi USB key/dongle plugged into the socket of a laptop or tablet (in the future such technology will be built into laptops and devices). The LiFi USB dongle returns data to the luminaire through an infrared link. With Philips LiFi-enabled luminaires, customers get the double benefit of quality, energy-efficient LED light and a highly secure, stable and robust connection as LiFi has 10,000 times the spectrum of WiFi. 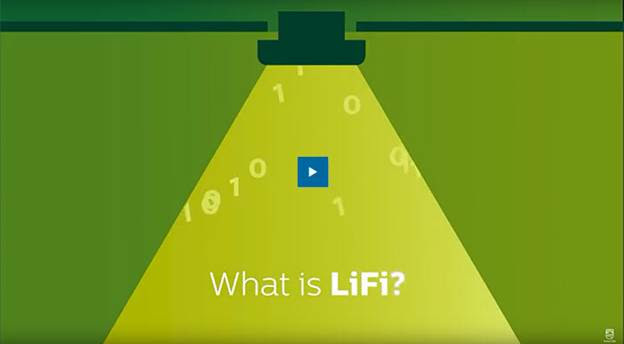 Why LiFi from Philips Lighting? Philips Lighting leads the way in offering seamless hand-over between light points; meaning that as a user moves from one side of a large office to another, they maintain their connection as one light point hands off to another. The coverage-zone provided by Philips LiFi-enabled luminaires is also believed to be the widest in the market. The company has LiFi-enabled normal office luminaires that provide quality energy-efficient light. Philips Lighting offers LiFi-enabled Philips PowerBalance gen2 and Philips LuxSpace downlight luminaires. Click here For more information about Philips LiFi-enabled luminaires. Philips Lighting is showcasing its new innovations at Light+Building 2018. Media and bloggers are invited to join the Philips Lighting press conference, on Monday, March 19, at 13.00 CET at the Philips Lighting booth Hall 0: Forum. You can also watch the press conference webcast live Click here.